Top row (left to right): 1. Dean Borchin, 2. Andy Baxter, 3. unidentified, 4. unidentified, 5. Deena Kendrick, 6. unidentified, 7. unidentified, 8. unidentified, 9. unidentified. Second row: 1. Kristen McCloskey, 2. Teddy ?, 3. Michelle Makiwi, 4. Roger Marsh, 5. Lori ?, 6. unidentified, 7. unidentified, 8. Steven Owden, 9. Kelly Young. Third row: 1. Nancy Abruzzo, 2. Scott Pence, 3. Heidi Komlofske, 4. Greg ?, 5. no picture, 6. unidentified, 7. Tony Governor, 8. unidentified, 9. unidentified. Fourth row: 1. Mrs Mullins, 2. no picture, 3. no picture, 4. no picture, 5. no picture, 6. no picture, 7. no picture, 8. no picture, 9. Don Larson. Credits: From the collection of Heidi Thaw. The kids in the picture are members of the high school graduation class of 1984. To find other pictures of the class of 1984 in the archive, see Livermore class pictures listed by year of high school graduation. And if you have any pictures of the class of 1984 that you would like to share, please submit them to the Archive. 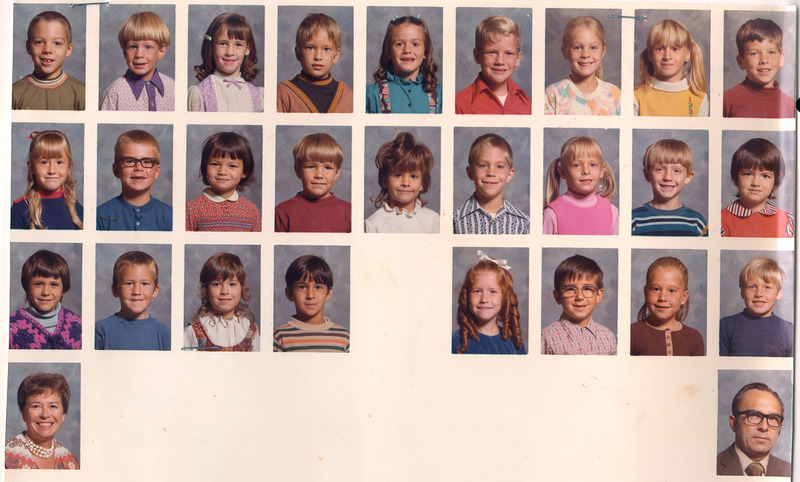 To find other pictures from Jackson Avenue School in the archive, see Livermore class pictures listed by school. And if you have any pictures from Jackson Avenue School that you would like to share, please submit them to the Archive.